The Confidence & Clarity Survey was created by the Law Office of Andrew J. Goldberg in 2018, to see how business people were feeling about the economy and their organizations and what business advisors anticipated from their clients. Inspire conversations with external advisors on how to implement new initiatives, improve on strategies already in place, and take advantage of opportunities. 2018 Survey respondents consisted mainly of individuals holding leadership positions in organizations predominantly having from 10 to 100 employees, and with annual revenues between $2,500,000 – $20,000,000. These organizations tended to be in the manufacturing, retail and wholesale services, professional services, health care, and marketing and advertising industries. 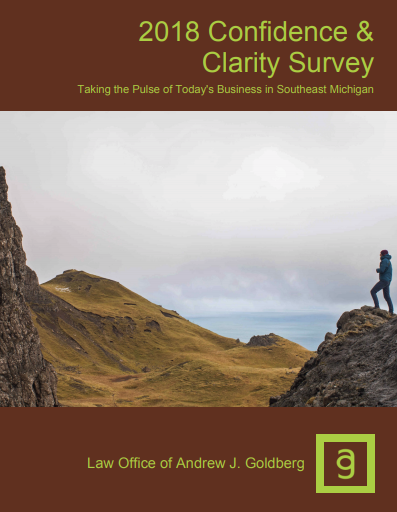 Share the link of this survey with your network to help us better the information and knowledge shared and collected with businesses in southeast Michigan. You are important to the business community. Typically, it will take 10 minutes or less to complete. Newer Post65 Michigan Applebee’s Locations Enter Craft Cocktail Market with Features from Valentine Distilling Co.